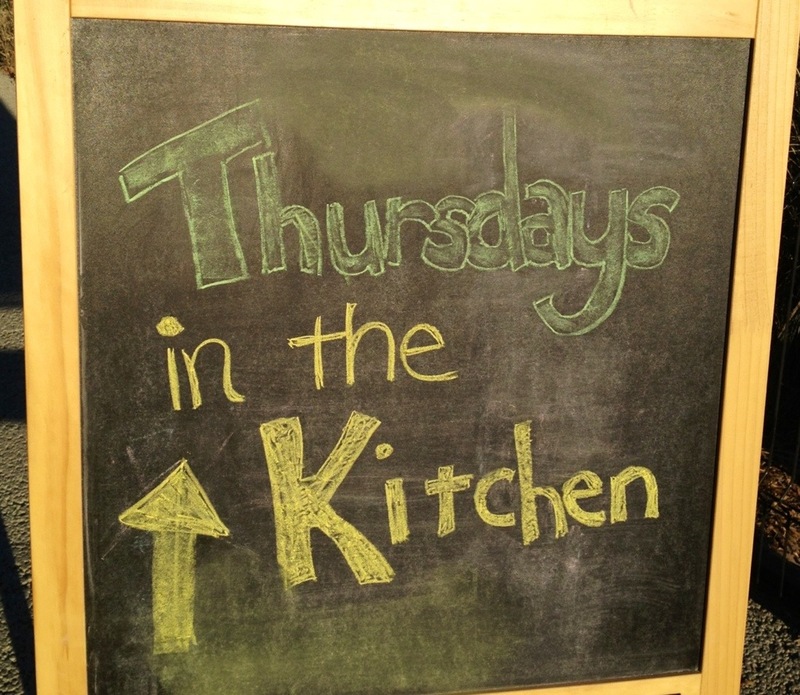 Thursdays in the Kitchen are BACK! 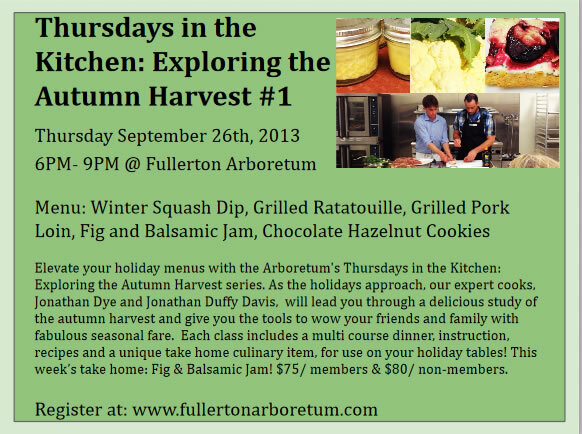 Thursdays in the Kitchen: Exploring the Autumn Harvest classes start this week at the Fullerton Arboretum! Author Table & FieldPosted on September 24, 2013 Categories alicia hitchcock, brea, classes, cocktails, eat the yard, Evelyn Brown, farming, fullerton, gardening, how to, Jonathan Duffy Davis, Jonathan Dye, local food, projects, recipes, Thursdays in the KitchenTags arboretum, autumn, autumn harvest, basalmic, brea, chocolate hazlenut, classes, cooking class, cooking classes, fig, fig basalmic, fig jam, figs, fullerton, Fullerton arboretum, harvest, jonathan duffy davis, jonathan dye, lillet, pork loin, ratatoullie, squash, squash dip, white lillet, winter squash, winter squash dipLeave a comment on Thursdays in the Kitchen are BACK! 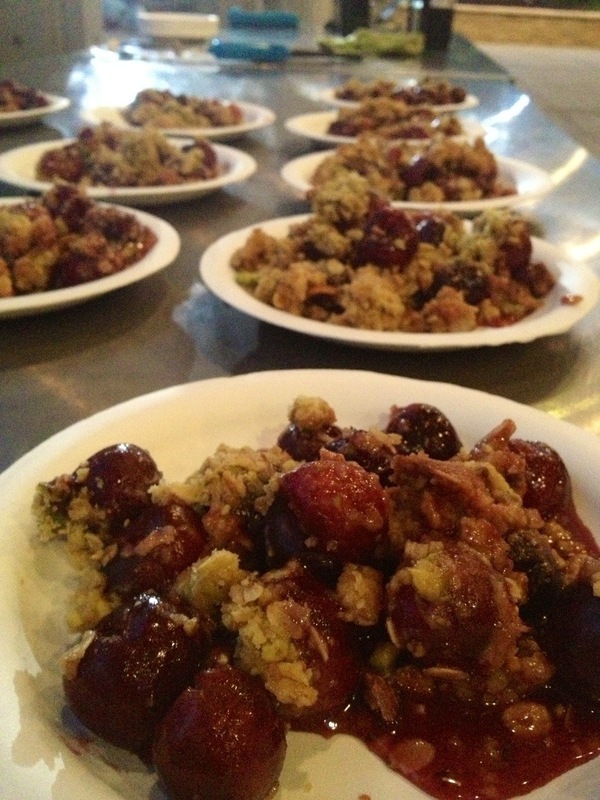 A Photo Gallery From The Muck’s Summer Farm Dinner, Have A Look! This historic house in the hills of Fullerton is a gorgeous setting for a summer farm dinner. The Muck, as it is know, is a center for community and culture serving the citizens of north Orange County and beyond. We recommend you check it out! 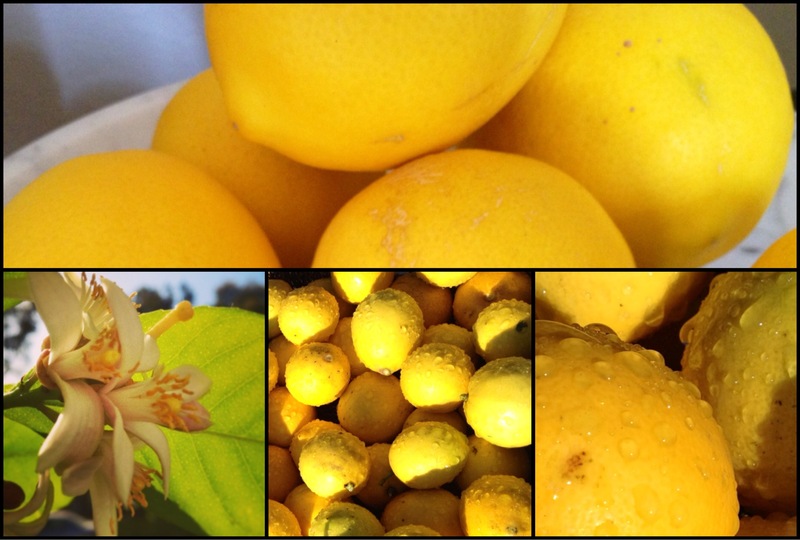 These organic beauties were grown on the Fullerton Arboretum’s farm and used in The Muck’s farm dinner. Farm dinner patrons enjoy passed appetizers and drinks in the main gallery before sitting down to dinner. 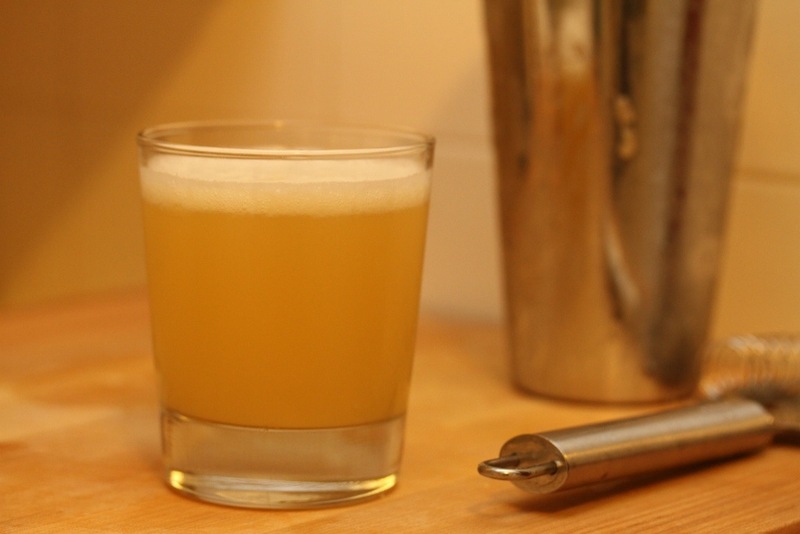 A refreshing libation to start the evening off right, Rhubarb and Elderflower Bellinis, served in the main gallery. The table waits for guests. The Muckenthaler family had their farm dinners in this same location. This festive table harkens back to the soul of this historic property. Crisp and fresh, a vareity of peppers grown at the Fullerton Arboretum. Chef Jonathan Dye, making the pasta for the ravioli course right in The Muck’s kitchen! Talk about fresh! Farmer and Chef Jonathan Duffy Davis prepares the homemade herbed ricotta filling for the ravioli. Guests fill the table and get excited for the meal, as the sun begins to set on Fullerton. This beautiful chilled avocado and corn soup with cilantro oil is made with Fullerton Arboretum produce! These colorful squash adorn the farm table and remind us that fall is just around the corner. They were grown on the Arboretum’s Farm! Guests raise a glass to friends and family. Arboretum nectarines being prepared for desert! 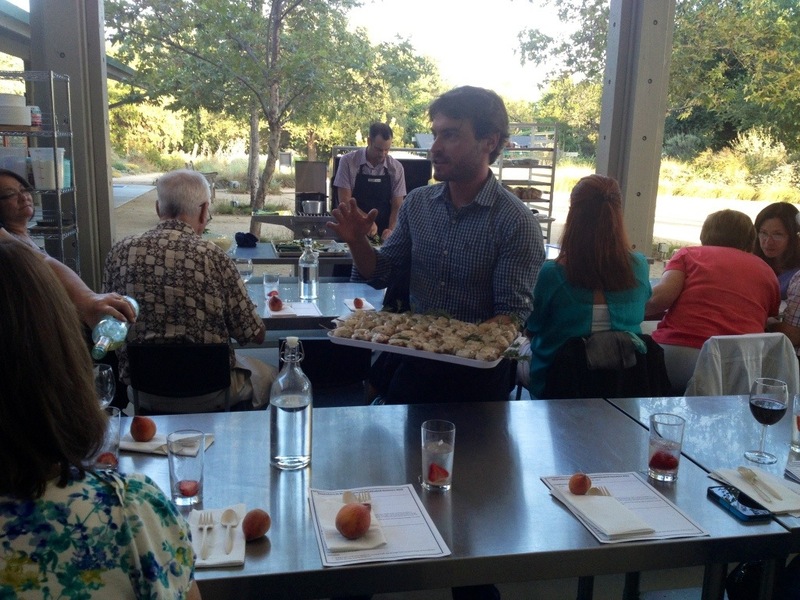 Chef Jonathan Dye and Farmer Jonathan Duffy Davis speak to the table about food being eaten. Incredibly flavorful balls of delight! Charentais & Musk Melons paired with prosciutto, basil and mozzarella make a delightful summer salad. As evening comes to The Muck, the table and grounds grow more gorgeous. The evening comes to a close with the nectarine crisp the summer heat giving way into a cool evening. What a beautiful night! Author Table & FieldPosted on July 27, 2013 Categories cocktails, farm dinner, fullerton, how to, Jonathan Duffy Davis, Jonathan Dye, local food, projects, recipesTags arboretum, bellinis, caponata, Charentais, crisp, crostini, eggplant, farm fresh, farm to table, flank steak, fullerton, Fullerton arboretum, jonathan dye, jonthan duffy davis, muckenthaler, Musk Melons, organic, ravioli, roulade, the muck, tonnata, zootLeave a comment on A Photo Gallery From The Muck’s Summer Farm Dinner, Have A Look! 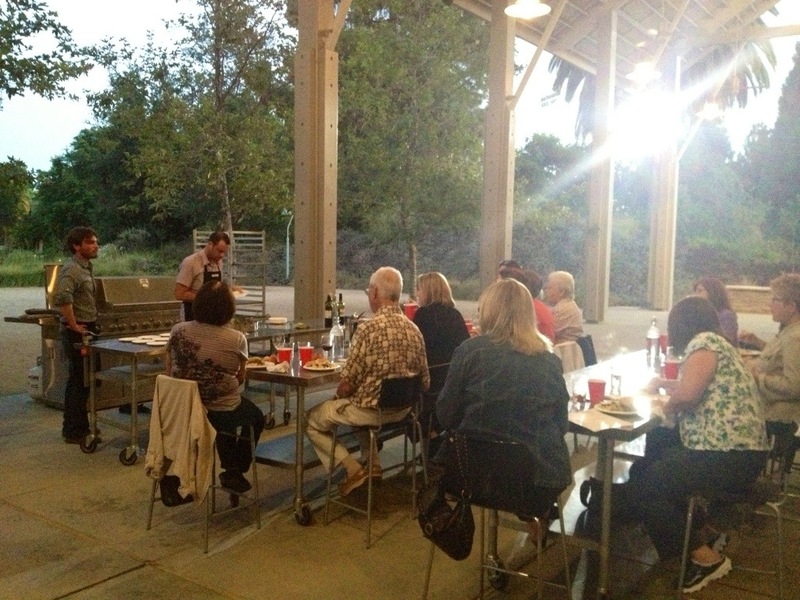 Recipes from Fullerton Arboretum’s “Your Summer Entertaining Menu Made Easy” Cooking Class! Cooking outside on a summer evening is wonderful! And enjoy some photos from class…. 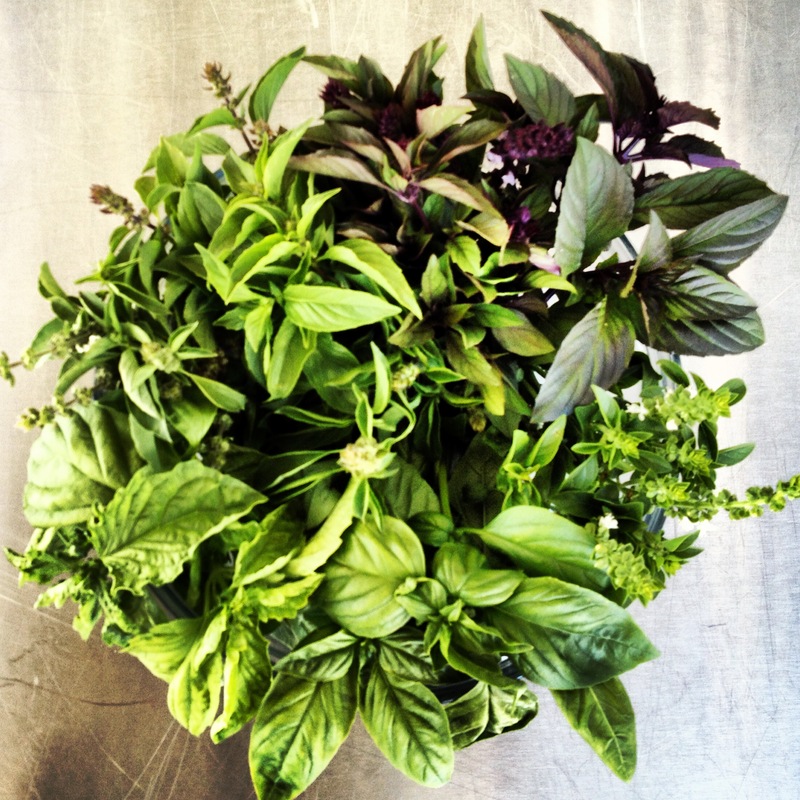 Four types of basil grown right here at the Fullerton Arboretum accompanied tonight’s menu! Author Table & FieldPosted on June 20, 2013 Categories classes, cocktails, fullerton, how to, Jonathan Duffy Davis, Jonathan Dye, local food, recipes, UncategorizedTags arboretum, blueberry ice cream, blueberry tequila ice cream, chimchurri, fullerton, jonathan duffy davis, jonathan dye, salsa, watermelon cocktailLeave a comment on Recipes from Fullerton Arboretum’s “Your Summer Entertaining Menu Made Easy” Cooking Class! 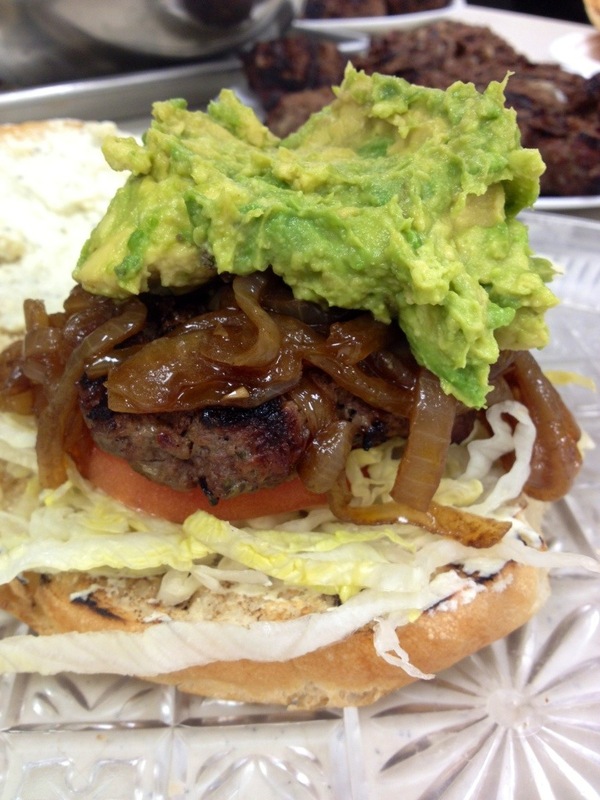 Hello Thursdays in the Kitchen Friends! 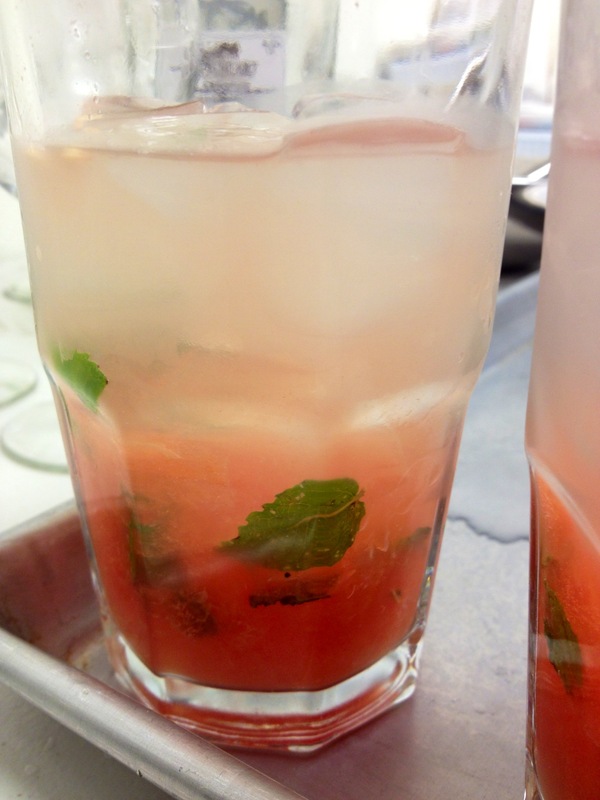 Here is the recipe booklet from class tonight and a few pictures of the action! 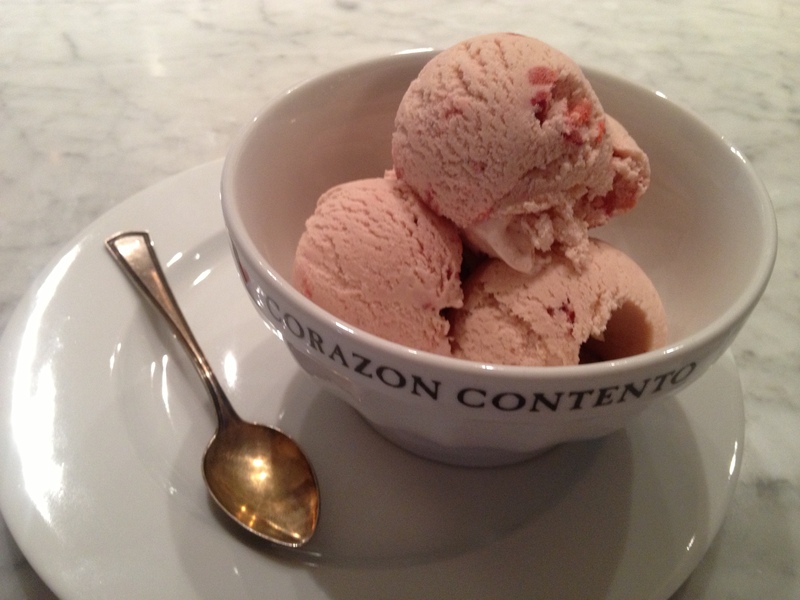 Share it with your friends….